In the arid and semi-arid land (ASAL) counties of Kenya, people are experiencing a food security and nutrition crisis as a result of the drought that has worsened since August 2016. The drought has undermined coping capacities and exacerbated vulnerabilities, for example by destroying livelihoods and triggering local conflicts over scare resources. This report draws on research conducted in two ASAL counties - Turkana and Wajir - on how people are coping. 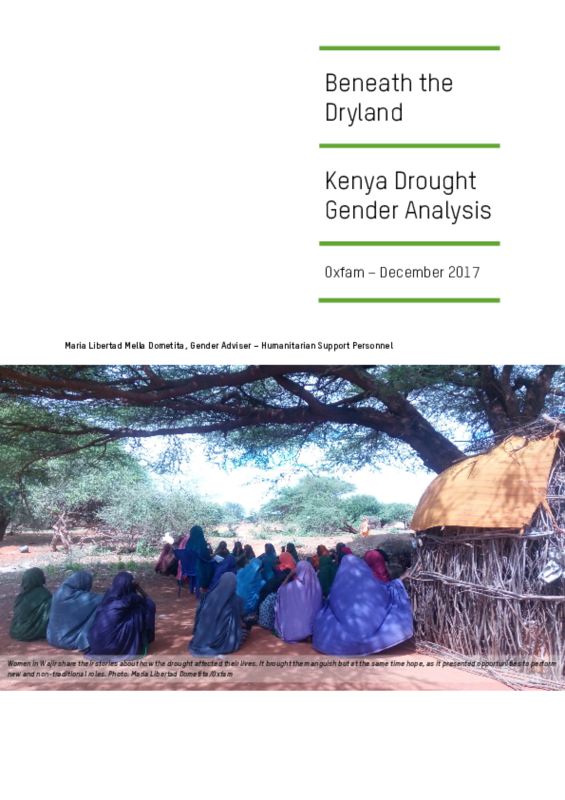 The main objective of the research was to understand the gendered needs, vulnerabilities and capacities of people in Turkana and Wajir and the specific gendered risks they face, in order to identify opportunities for increasing their agency, voice, participation and economic empowerment. The study also sought to understand the interactions between duty bearers and people affected by the drought, and the capacity of duty bearers to provide humanitarian assistance. The report presents key findings from the research and recommendations on how to strengthen the humanitarian response.